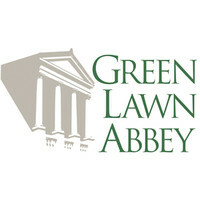 Green Lawn Abbey is a superb example of neoclassical architecture expertly executed in the style of 16th century Italian architect Andrea Palladio. Configured like an Italian villa, the 2nd floor has high ceilings, sports free standing marble columns, marble mantles, and is graced with natural lighting from its many stained-glass windows. The Abbey is a 2-story symmetrical building; its most prominent feature is the classical Tuscan-style portico topped by a pediment inscribed with the year 1927, and “Green Lawn Abbey” carved into the frieze.